In Australia it is currently nearing the end of Term 4. We are a few weeks away from the end of the school year. 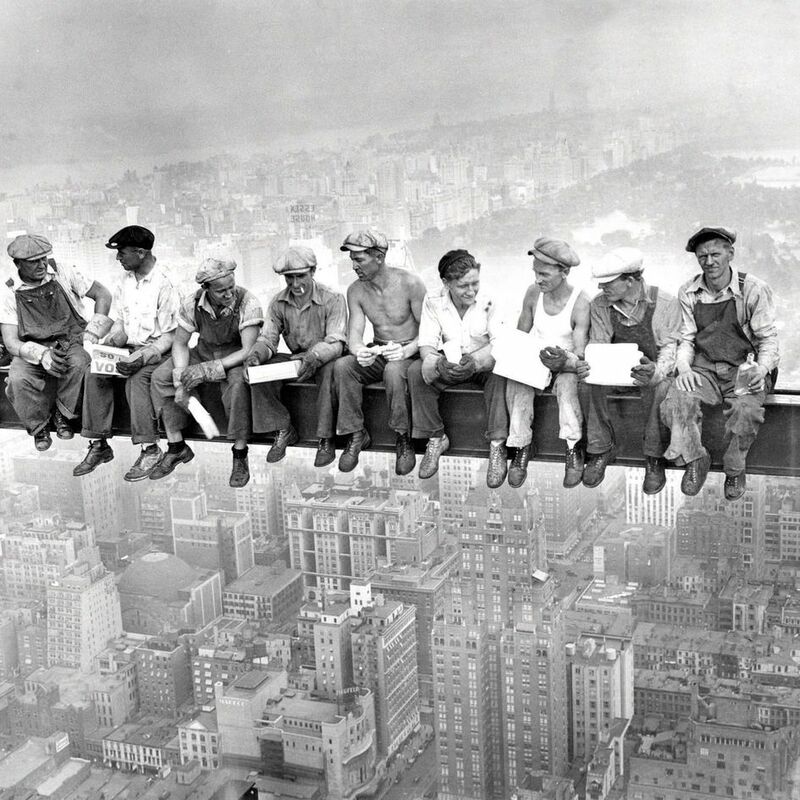 Often at this time of year I see the exhaustion on my colleagues’ faces, the weariness in their bones. I used to look forward to Term 4 as a time when I assumed the work in schools would wind down. The sun would be shining with the promise of summer, and slowly I would be able to find slivers of time to luxuriate in thorough planning for the year beyond. In reality, finishing the school year as a teacher or school leader is like running full pelt off a cliff. You run as fast as you can until you realise that the year has ended and given way beneath you. But you are still running. Many schools are on an innovation trajectory that leaves casualties in its wake. The desire to be on the cutting edge sometimes leaves us bleeding. As Andy Hargreaves, Shaneé Washington and Michael O’Connor point out in their chapter in the upcoming Flip the System Australia book, there can be no student wellbeing without teacher wellbeing. They point out that wellbeing initiatives like yoga and meditation add-ons don’t fix the underlying factors eroding teacher wellbeing and morale. The end of Term 4 is always a strange time in schools. We are finishing off one year (marking, reporting, preparing for final events), but we are simultaneously planning for the following year (writing course programs, organising staff days, finalising staffing, deciding on strategic foci). We are at once in the present, the future, and betwixt the two. In education we are always looking to the future. We are constantly reflecting on where our students are now, where they need to or could be, and how we can help them get there. We strategically plan innovations with the short and the very long term in mind. How will we assess the knowledge and skills we are teaching? What will our students need to know in the world into which they will eventually graduate? On what 21st century skills and capabilities should we be focusing? How might artificial intelligence, automation and data science change education and what do we need to know and do about it? What is the ‘next big thing’ in education? Ever since I started teaching almost twenty years ago I have been in the eye of this future-focused vortex and the relentless cycles of change that are propelled by it. It doesn’t help that education is hyper-focused on competition, or that schools and teachers are pitted against one another. Or that the media constantly runs fear mongering stories about the decline of [insert latest media education trend or most recent high stakes test or particular school sector]. Or that our political cycle perpetuates short termism, making education a card to be played in exchange for votes, rather than a long term priority deserving of deliberate, well-resourced action. We need to stop looking for the next big thing and instead focus on doing the last big thing properly. I am focusing my 2019—and by ‘my’ I mean my portfolio of work including professional learning, pedagogy and research at my school—on consolidation. Embedment. Going deeper. Strengthening and enriching the work we are doing. Doing things better and more thoroughly. Spending time in deliberate practice followed by thoughtful reflection and refinement. A declaration at the beginning of the school year that ‘this year, we are going to consolidate’ may incite sighs of relief from teachers. What? they may think, Nothing new this year? I don’t believe it! Consolidation is a challenge in education, when there is so much more we could always be doing. At the beginning of this year, I was intentional about what I could let go of in order to do those things that really mattered to me. It is important in education that we decide where our efforts are best placed, and then work to do those things really well. We need to seriously consider what we can stop doing, or do differently, in order to pursue what it really worthwhile. Let’s do really good things well, not ‘all the things’ badly and in a state of blind panic. Consolidation doesn’t mean there is no work to do. It doesn’t mean standing still or stagnating. It means doing better what we are already doing now. It means connecting in with one another to learn from each other, celebrate, challenge and share our expertise. It means continuing to develop shared understandings and shared practices, and looking back occasionally to remind ourselves of how far we have come. Consolidation in 2019. Can it be done? Watch this space. Over the last few days I have been watching the Future Schools conference hashtag and wondering about education’s obsession with the imagined future and with constantly attempting to rebadge education to address it. Despite STEM and coding being clear national foci for Australia, yesterday Rob Stokes, NSW Education Minister, put a spanner in the works when he claimed that STEM has become a buzzword and a fad, arguing for a holistic multi-disciplinary approach to education where humanities, arts, philosophy and literature are valued equally to science, technology, engineering, and mathematics. There is plenty of money to be made by consultants and corporations, however, when ‘the future’ is marketised and everyone with five minutes in education is encouraged to be a -preneur who disrupts the status quo, reimagines education, and looks with disdain at traditional teaching methods or a focus on knowledge. The notion of being on the cutting edge and hurtling towards ‘the future’ dovetails with my recent reading and thinking around the current review of our school library. We are reconsidering our library’s purpose, functions, roles, and resources. 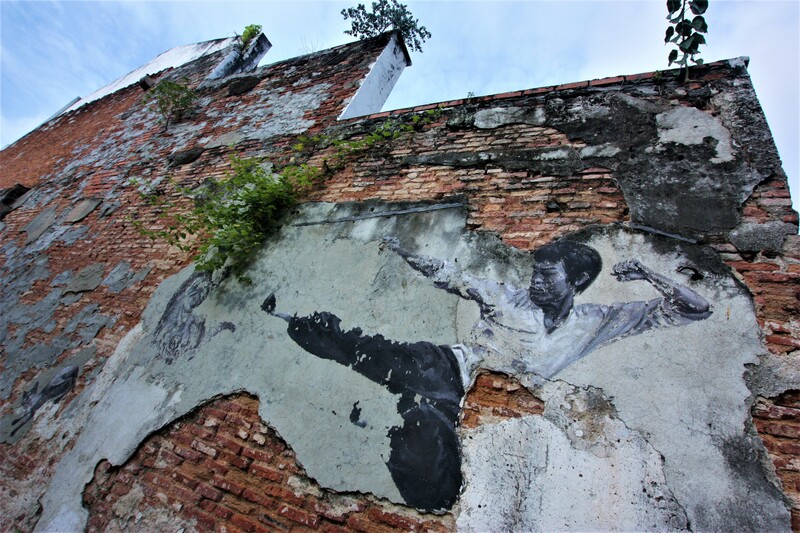 I am in the process of drafting a review of scholarly literature and current practice around libraries, which are very much caught up in fighting for relevancy through a simultaneous championing of the past and predicting the needs of the future. ‘Library’ is an idea that has been around since the ancient world. Cassidy (2017) points out that the Great Library of Alexandria, built around 300BC, wasn’t great just for its collection of books, but its “intellectual raison d’être: the insatiable pursuit, creation, and dissemination of knowledge as a force to drive civilisation” (p.3). He argues that the Great Library wasn’t about books or architecture, but about knowledge and access to information. The classical library served as an exemplar of the national public and a symbol of imagined community (Delica & Elbeshausen, 2017). The library throughout time has had in many ways a constancy in its role and function, a commitment to sustaining and creating culture despite, and perhaps because of, social and global change (Wilkin, 2015). Lankes (2011, 2016) points out that the tools of the library change but that those things that remain constant are the why of libraries. They remain a core democratic institution that provides access to and preserves our scientific and cultural heritage (Palfrey, 2015). Over time, libraries have become increasingly localised and community-oriented (Delica & Elbeshausen, 2017). 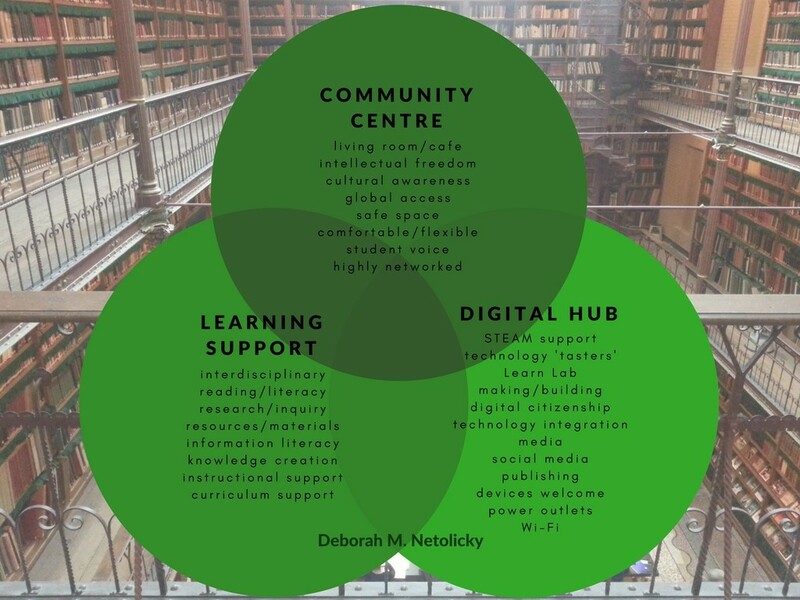 The three key areas that have emerged from the literature, for consideration around our school library, are library as community centre, learning support, and digital hub, with those aspects outlined as follows. While studies reveal that reading books is important for thinking and success (e.g. Djkic, Oatley, & Moldoveanu, 2013, who suggest that reading fictional literature leads to better procedures of processing information generally, including those of creativity), the pressure is on for libraries to cull print resources in favour of electronic and technological ones. People are accessing resources anywhere, anytime, via apps, the cloud, and online repositories. Gesture sensing technology, voice recognition, artificial intelligence, machine learning, and self-publishing are changing the face of information and of libraries. The digitisation of content means that researchers can often access resources without entering the library, a change that I laughed about with my grandfather who did his PhD with paper copies of journals and a typewriter (and my grandmother, who did much of the typing). School libraries have been called instructional media centres, media centres, information centres, information commons, iCentres, learning labs, learning commons, digital libraries, and cybraries (Farmer, 2017). These terms are in some ways faddish and transitory. ‘Library’, however, has a deep and long tradition associated with it, although the spaces and tools of libraries change over time. Librarians in schools have also had many names, such as teacher librarian, library teacher, library media specialist, library media teacher, cybrarian, information navigator, information specialist, information professional, informationist, and information scientist (Farmer, 2017; Lankes, 2011). Lankes (2011) argues that the terms ‘library’ and ‘librarian’ are entwined with the concept of knowledge and learning. I have said before that those claiming disruption should embrace interrogation of their ideas. Does ‘library’ need to be disrupted, in what ways, and why (or why not)? 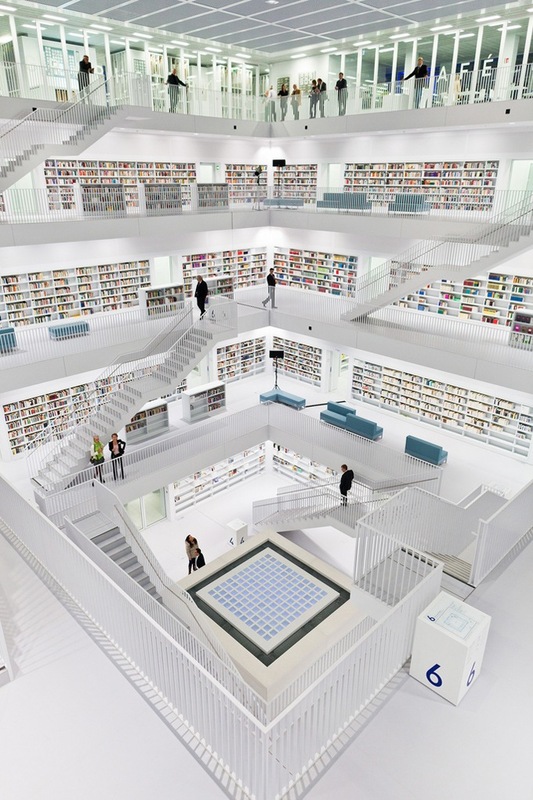 Libraries around the world are reinventing themselves. Somerset Libraries call themselves a dynamic, evolving and integral part of the community that open up a world of opportunities for reading, understanding and discovery. Albert Kivits, Head of the Eindhoven public library in the Netherlands outlines the concept of the public library moving towards a House of Data, Information and Wisdom. Pilar Martinez, CEO of the Edmonton Public Library in Canada, calls modern libraries ‘porous’, referring to their multi-way information and the way that the community reaches into them, and they reach out into the community. As well as print books, e-books, audio books, music, periodicals, and DVDs, many public libraries offer interactive areas, classes, courses, study groups, makerspaces, and technology such as 3D printers, Raspberry Pis, Micro:bits, and the capacity for photography, video-making, podcasting, and coding. Libraries provide ‘lab’ spaces for co-production, exploration, and making new knowledge (Palfrey, 2015). Chicago Public Libraries has the YOUmedia Centre in which teens engage in projects across a variety of core content areas including graphic design, photography, video, music, 2D/3D design, STEM and hands-on making. San Francisco Public Library has The Mix teen centre, which houses a collection of young adult books, a mini-amphitheatre, a state-of-the-art recording studio, a video production space, a bank of high-end computers to aid in the editing process, and a makerspace with leading fabrication technologies. The New Taipei City Library in Taiwan is a ten-story high rise in which each floor features a specialised function with separate zones dedicated to media, video viewing booths, and entertainment spaces. The University of Adelaide Libraries’ ‘Library of the Future’ report (Gregory et al., 2015) is well worth reading. These libraries are inclusive, vibrant, and high-tech, and focused on equity, capabilities like critical thinking, and the needs of the individuals within their communities. Last year I wrote about my then-thinking about libraries. Even though current libraries look, feel, and sound different, I wonder if I am being old-fashioned and English-teachery by wanting our library to be called Library. Should I be persuaded to call it an Information Science Hub of Preneurism, or an Apptastic iLearning Maker-Thinker-Coder Space, or a House of Knowledge, Innovation, and Disruption? Is it outdated to cling to the concept of ‘library’ as a place of knowledge, access, thinking, equity, and ideas? Palfrey (2015) challenges us that “dynamism must be the watchword for libraries in the digital age” (p.41). ‘Library’, I think can remain relevant to the user of the future, by keeping its core mission close, and thinking creatively about the tools, spaces, and resources to bring this to life for its community in a changing world. *Disclaimer: Actual books were read in the preparation of this blog post. Cassidy, K. (2017). This is what a librarian looks like: A celebration of libraries, communities, and access to information. New York: Black Dog & Leventhal Publishers. Delica, K. N., & Elbeshausen, H. (2017). The social library in three contexts: Programmes and perspectives. Journal of Librarianship and Information Science, 49(3), 237-245. Djkic, M., Oatley, K., & Moldoveanu, M. C. (2013). Opening the closed mind: The effect of exposure to literature on the need for closure. Creativity Research Journal, 25(2), 149-154. Farmer, L. S. (2017). Managing the successful school library: Strategic planning and reflective practice. Chicago, Neal-Schuman. Gregory, M. et al. (2015). Recommendations for a bold and agile University library: Library of the Future. University of Adelaide. Lankes, R. D. (2016). The new librarianship field guide. Cambridge, MA: The MIT Press. Palfrey, J. (2015). BiblioTECH: Why libraries matter more than ever in the age of Google. New York: Basic Books. Wilkin, J. P. (2015). Meaning of the library today. In A. Crawford (Ed.) The meaning of the library: A cultural history, Princeton, NJ: Princeton University. Teaching apprenticeships: Legitimate pathway or the death of the profession? Teaching is a complex profession that requires a range of knowledge, skills, and practices. It also has a human, emotional, and relational dimension. I have been a teacher for almost 20 years and despite multiple degrees, constant professional learning, and decades of experience, I am still constantly learning and incrementally improving in terms of my teaching practice. Last week UK education secretary, Justine Greening, announced that higher apprenticeships will become a technical route to teaching in the UK. That is, someone wanting to become a teacher will not need to earn a university degree, but will be able to do so via a vocational path. That the Schools Week article suggests that low apprenticeship wages will be a cost-saving measure for schools suggests that an apprenticeship pathway to a teaching career is about cheaper, faster labour, rather than how to train teachers in the best way. This has been pointed out by Laura McInerney who says, “This shift to apprenticeships, therefore, starts to look like a way to pay A LOT of teachers a low-wage throughout their ‘training’ years — and never pay many of them a full wage,” undermining Greening’s claim that she wants teaching to remain a highly regarded, high status profession. McInerney also notes that teachers are very attached to the notion of our profession as a graduate one, in which a university degree provides part of the foundation. As a member of the profession, I feel this, and have been challenged on social media about whether I am being a snob about qualifications by being critical of the notion of apprenticeship teacher training. Others, too, have been accused of elitism for opposing the apprenticeship idea. Even though these reforms are being suggested in the UK rather than Australia (and it has been almost 10 years since I have taught in the UK), I’ve been thinking about it over the last week. Why do I believe that teachers should have a degree? Is resistance akin to snobby elitism, or is this a key issue on which we must hold the line? As part of my current role I place student teachers at my school for their teaching practicums, and I wonder if all schools provide appropriate workplace learning environments. But much of my gut feeling about an apprenticeship route to the classroom is around a belief that teaching should be a valued, knowledgeable and skilled profession. Teachers should be respected members of our communities. I don’t think a degree is sufficient for teaching–it’s not all we need–but I think it is necessary. A degree provides a foundation of knowledge, integrity, and credibility, in terms of subject knowledge and theoretical knowledge of teaching itself. It is also about the skillset we get through the process of a university degree. My various university qualifications, including the PhD, have provided me with the bedrock for the learning I do every day in the course of my career. My university studies also show my students, and the school community, that I value education and have expertise to share. The qualifications of a school’s leaders and teachers are often published, demonstrating the education foundation of that school’s staff and suggesting their capacity to educate the students in their care. What do you think? Should teachers have university degrees or are more vocational pathways to the career appropriate? Can an apprenticeship have parity with a degree? Does learning teaching ‘on the job’ make sense? Or will apprenticeship options, and related wages and conditions, devalue and demoralise the profession?